Hillcrest Lutheran Academy of Fergus Falls, Minnesota celebrated a milestone in 2017—the 100th year of the Church of the Lutheran Brethren’s high school department. 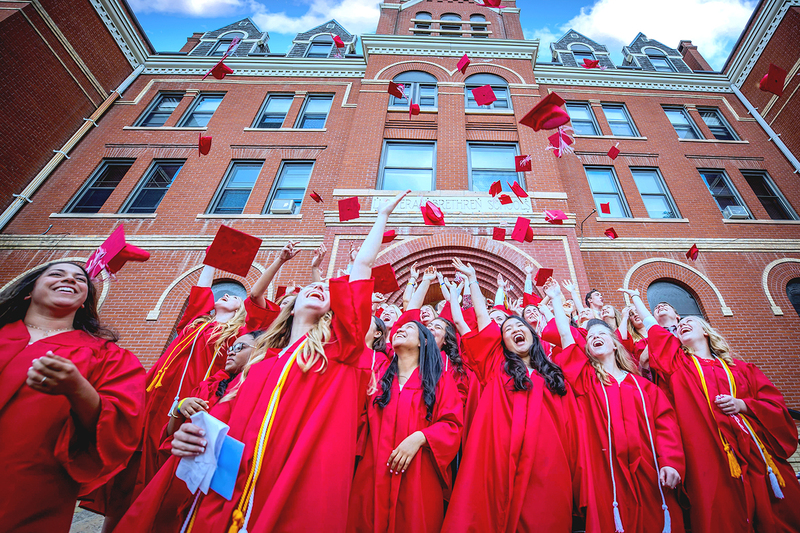 The graduation weekend, a culmination to the celebration of what God has done over the past 100 years, cast a strong vision for honoring and serving the Lord in the coming years at Hillcrest Lutheran Academy. The centennial weekend began Thursday, May 25 with a banquet initiating the Athletics Hall of Fame at Hillcrest. William Colbeck, Jody (Christenson) Brasel, Scott Colbeck, Jesse Keller, Nick Hansen, Jared Schultz, and Jorgen Greve formed the Hall of Fame inaugural class. Paul Levang recounted stories from the early days of Hillcrest’s sports program as the late William Colbeck was honored for his work in establishing competition with area high schools, and helping Hillcrest join the Minnesota State High School League. Jody Brasel was honored by friends sharing stories and memories of her standout athletic career, highlighting Jody as a caring friend. Coaches Richard Risbrudt and Gregg Preston reminisced on the play of Comet standouts Scott Colbeck, Jesse Keller, and Nick Hansen. They set a high standard of character and integrity to which all Hillcrest athletes may now aspire. Accolades were secondary as Scott Colbeck and Nick Hansen spoke of character-building experiences as part of Hillcrest athletics. The all-school concert was held at Bethel Lutheran Church on Friday, May 26 where Hillcrest’s choir was recognized for their discipline and attention to honoring Christ in their year of choral training. Their closing song, Praise to the Lord, caused the room to stand in gratitude for the choir’s work in directing attention to the Lord. Hillcrest’s interim president Joel Egge fought tears as he closed the concert, his hand holding tightly to his Bible as he thanked the choir with hugs following the benediction. Over 300 alumni gathered at the all-school reunion festivities on Saturday, May 27 at Hillcrest’s alumni brunch in the Student Activities Center and at the all-school reception in the newly created Student Union. The brunch announced the status of the John Luckey endowment, created by the class of 1967, with over $70,000 raised. Luckey died in a tragic accident before he was able to graduate from Hillcrest with the class of 1967. The class of 2017 also lost a class member months before graduation after Hayley Filippini passed away following a battle with cancer. The class of 2017 also created a named endowment, in honor of Hayley. The Hayley Midland Filippini endowment currently has over $10,000 after the graduating class of 2017 devoted much of their school year to fundraising for the account. David Veum and Crystal (Overland) Veum were announced as Hillcrest’s 2017 Alumni of the Year as part of the alumni brunch. The crowd of alumni then gathered in Hillcrest’s chapel for the dedication of the J.H. Levang gallery, followed by the ribbon cutting in the main hall. After that, Hillcrest, Bible School, and Seminary alumni toured the Hillcrest castle to discover the ways God is continuing to use Hillcrest Lutheran Academy to train young people. Following tours, groups gathered in the Hillcrest Student Union for refreshments and an all-school gathering where artifacts were on display from Hillcrest’s 100 years of ministry. The high point of the Centennial weekend was the Baccalaureate Service and Commencement exercise. Hillcrest welcomed many to the stage to honor the class, including Freddy Ovalle from the Santa Fe school in the Dominican Republic and Hillcrest Lutheran Academy’s new president Brad Hoganson. 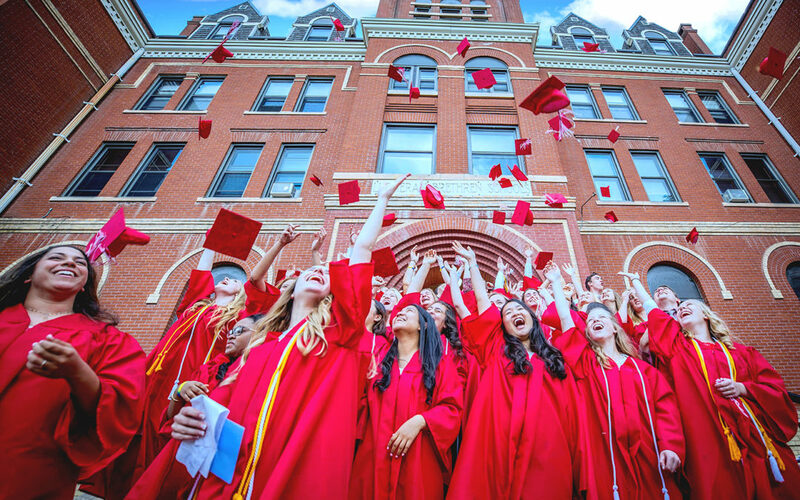 Following the closing exercises, the class of 2017 followed tradition in gathering on the front steps to sing their class song (In Christ Alone) and toss their hats. Then they ventured to the Student Union for the President’s reception where Brad and Tracy Hoganson greeted students, parents, friends, and alumni. Wayne Stender serves Hillcrest Lutheran Academy as its Director of Enrollment and Marketing.